Bonjour lovelies! Au jourd'hui on commençe la premiere leçon en français! Are you excited? I am! While I am far from being fluent in the language, learning and speaking French is passion of mine - and I hope to spend at least a year in the country soon. I have been blessed to have visited France several times, and I cannot wait to go back! 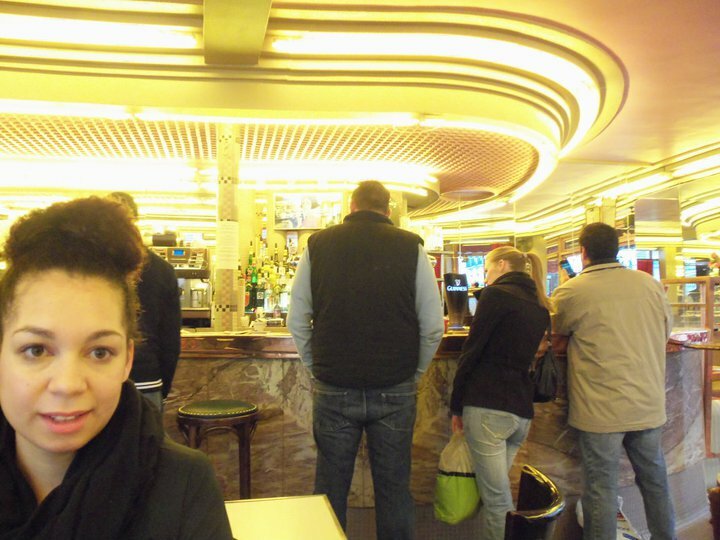 Sitting in Le Café des Deux Moulins, in the 18th, Feb 2011. Je suis d'améliorer ma vocabulaire quand j'utilise le mot "améliorer". I am improving my vocabulary when I use the word "improve". Je suis chercher pour m'améliore toujours. I am always looking/searching for ways to improve myself. Ma poupounette, si le dejeuner est fade, tu besoin l'améliorer! My dear, if the lunch is bland/boring/tasteless, you need to improve it! My absolute favorite scene from the movie. The complimentary colors make me so happy! Also, a fun little association I have with this word is the French movie, Amélie. For those of you who have seen it, you know that Amélie, the main character goes around improving other peoples lives. Fun little play on words, isn't it? For my next lesson we're taking an entire tour of France, but not in the way you think! Girl, you got skills. I wish I could speak French. It's such a romantic language. I feel like I would jump the bones of anyone who spoke it to me. Guy or girl. What a great word and something I try to use in English as well! I can't wait to go back to France as well (to shop! )....ahhh someday! Hoping you get the Dior rings from my post some time - I'm sure you deserve them! LOVE this new feature. :) I practiced saying that word seven times by the way. I'm so terrible at foreign languages (especially French) I still don't think I got it quite right. Lol. i hope you don't get the notorious paris syndrome. J'améliore mon vocabulaire en utilisant le mot "améliorer"